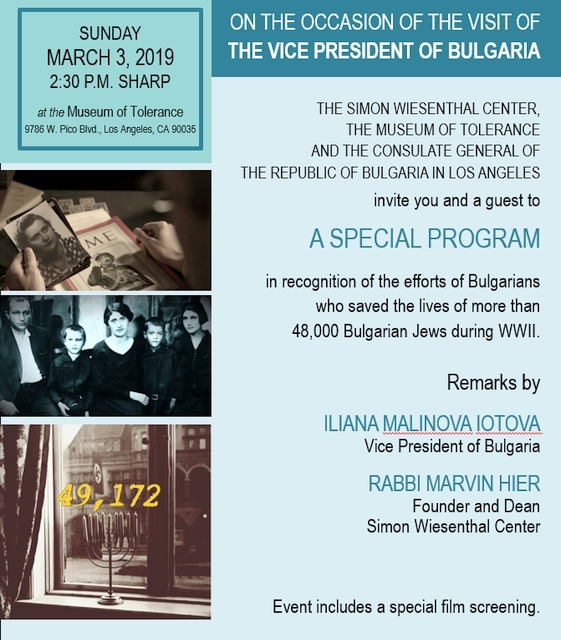 in recognition of the efforts of Bulgarians, including members of Parliament, leaders of the Bulgarian Orthodox Church, public figures, intellectuals and others who in the spring of 1943 prevented the deportation to the Nazi death camps and saved the lives of more than 48,000 Bulgarian Jews in Bulgaria proper. While millions of Jews in Europe were already being sent to Nazi death camps, a handful of people in tiny Bulgaria stood up against Hitler… and succeeded. Q&A with Writer/Producer Atanas Kolev following the screening.